An unnamed man and his dog in Saints John, Colorado, near Montezuma, date unknown. 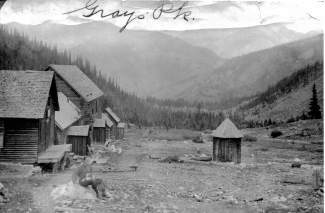 The inscription on the photo reads "Gray's Peak.â The town that had been founded there was officially called Saints John by 1870 and had 71 residents. This week in Summit County history as reported by the Summit County Journal 100 years ago. The ladies of St. John’s Guild entertained Wednesday afternoon from 2 to 6 at the home of Mrs. W.H. Briggle. In honor of the event, the Briggle home was tastefully decorated. The day being Flag Day, the dining room was resplendent in an abundant array of American flags; from the parlor came a fragrance of many flowers, potted plants being numerously in evidence, while from the chandelier streamed festoons of columbines. The music room too, was liberally and prettily ornamented with vari-colored blossoms. An interesting music program had been arranged for the afternoon, the ladies’ quintet consisting of Madames Robinson, Miller, Van Vactor, Keogh and Miss Clara Adams, a quartet consisting of Messrs. Arthur and Thomas Turkington, Mead and Harlan, solos by Thomas Goldie, Jack Harlan and Mrs. Hermann comprising the program. Mrs. Miner and Mrs. Briggle were accompanists. Sandwiches, fruit salad and coffee were served throughout the afternoon. A large crowd was in attendance and all were delightfully entertained by the ladies. County Commissioners Fletcher and Lindstrom, accompanied by nine men, made their way to the top of Hoosier pass Sunday and spent the day shoveling snow and otherwise making the road passable. Automobiles can now safely travel that route in and out of Breckenridge and several have made the trip during the past week. Those who have been making inquiries concerning the road and awaiting opening of the pass can now make the trip with the assurance that they will encounter no barriers. Negotiations were completed this week whereby Idaho Springs mining men have taken a lease and bond on the Muddy mining property in Galena gulch belonging to Mrs. J. Gough, Mrs. Jennie Carter and Mrs. Carrie Levi. It is understood that the considerable money is to be expended in developing the property. Some excellent samples of gold ore were obtained from the property last week by the leasees, who have made a thorough examination. Kansas City capital is said to be interested in the new project. The vault of the Bank of Sandy, twelve miles south of Salt Lake City, Utah, was wrecked with explosives and $2,200 in cash taken. Albert Brewer, eighteen of Reilly avenue, went fishing a few days ago at Ivory slough. The fish did not bite, so Brewer shouldered his pole and started for home. At Marceau and Reilly avenues he passed a fire alarm box. The door was open. The line caught the hook. It was the first bite Brewer had all day. The line jerked the hook down with such force that an alarm sounded. Brewer heard the jingle of the alarm and ran home. The police arrested him ten minutes later and charged him with turning in a false alarm. — St. Louis Times.